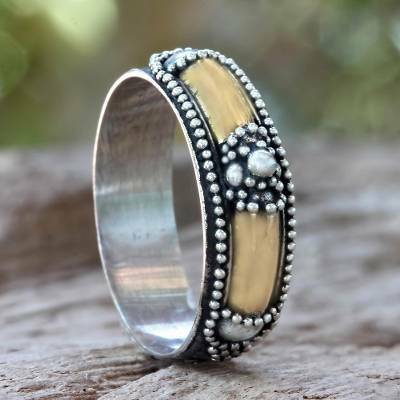 Hand Crafted Silver Ring with Accents in 18k Gold, "Royal Temple"
Bali's traditional silver granules cluster on a band of dark oxidized silver. Accents bathed in 18k gold enhance the beauty of this ring from Komang Wijayana. I have had a lot of compliments on this ring. I love it!!!!!!â?¤ï¸? Both the ring design and craftsmanship are superb. It is narrower than I'd expected, but I had not paid careful attention to the dimensions provided. The image is deceptive --- my fault for not reading carefully. "I will wear this ring everyday"
This is a beautiful dainty ring. The details on this ring were placed very artistically. Love your work Komang! The intricate detailing of this ring makes it a favorite -- and the mixed metals are versatile enough to be worn with pretty much anything. I love this ring! it is well made and I wear it all the time. It still looks like new after almost 2 years!